I hope everybody is having a Blessed Day. I know you're very busy since it's October (Pastor Appreciation Month). In this issue I have the "Top 5 Tips to Creating a Church Benevolence Policy with access to a free Church Benevolence Policy sample and access to the free Church Benevolence Request Form & Guidelines. Also below, Sunday School Lessons available again from an affiliate of mine that you might not want to miss out on. Shepherdbase (Church Membership Database) will track memberships (unlimited), contributions, attendance and much more for ONLY $34.99 so Hurry & Enjoy these Savings! Top 5 Tips to "Creating a Church Benevolence Policy"
Church Benevolence is an act of kindness or generosity. Many Church Benevolence programs provide for the basic necessities of life to a variety of needy persons including food, clothing, shelter, medical care and other types of assistance to the poor or less fortunate needy people. The church is allowed to give cash to a needy person(s) from the benevolence fund, but they have to keep in mind as with all other benevolent gifts, the purpose of the funds must be to provide for the basic necessities of life. An example is a church could make a cash gift to a family who suffered a loss recently due to a death or a natural disaster. The family could then use the benevolence funds to pay for what is most needed such as groceries, rent, transportation and other necessities. 1. Description of the Church Benevolence Purpose - Include a detailed description of the purpose of the Church Benevolence program such as to provide support to the poor and needy, etc. 2. Specific Criteria for the Church Benevolence - Include specific criteria to be used to determine whether a person qualifies to receive benevolence gifts such as income limitations, distressed situation, loss of job, death in the family, etc. 3. Identify Church Leader for Approving Benevolence - Choose the employee or Pastor of the church who will be responsible for approving or disapproving church benevolence gifts after discussing with the Church Board. 4. Identify Church Benevolence Amount Before Approval - Identify the benevolence amounts or types of gifts that can be distributed without approval from the Church Board or program leader. 5. 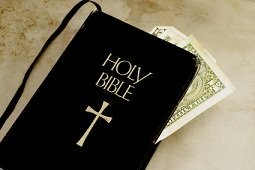 Maintain Benevolence Documentation - Whenever benevolence payments are made from the benevolence fund, the church should maintain documentation to show that the benevolence policy was followed correctly. You can accomplish this through a form that includes the name and address of individual receiving benevolence gift, the reason for payment, the relationship, if any, of the recipient to the church, signature of individual requesting benevolence gift, and approval by person(s) responsible for benevolence program. Click Here for the Church Benevolence Request & Process Form. Click Here for the Church Benevolence Policy sample. The Simple Sunday School Lessons are available through a great affiliate of mine that has created a gold mine of 168 unique Sunday School Lessons, PowerPoints, Activities, Prayers, Audios, and Much More for a very low affordable price of $37.00. Now you can lead an amazing Sunday School program without the worry and stress of creating lessons. We both know that being a Sunday School Teacher or a “Youth Leader” is serious business. Our work as a Sunday School Teacher has a DIRECT effect on the children we teach every Sunday. If a student enjoys learning about Christ at an early age, study after study has shown that they will be more likely to continue a relationship with Jesus for the remainder of their lives. If you are struggling with creating meaningful Sunday School lessons, you definitely need to check out these Sunday School Lessons and More by clicking the link below. Click Here for More Information on the Simple Sunday School Lessons. Click Here for the Free Sunday School Ideas with Forms. Free church forms, certificates, flyers...(500+ forms each in PDF and Microsoft Office Word format - some in Excel). Also continually updated to include the latest forms created. Bonus#3 - Beautiful 12 Month Photo Calendar in Microsoft Office Excel format that you can easily automate any year you want with the click of a button and change any of the photos very easily on any month you choose.